This picture conjures up so many memories for me. For starters, it was taken on the enclosed front porch in our house in Carterville, IL. I absolutely loved that porch, that house, that town, and that time in my life. This was taken on Halloween in 1980... or possibly a few days before Halloween (trying on our costumes). The Empire Strikes Back was all the rage. 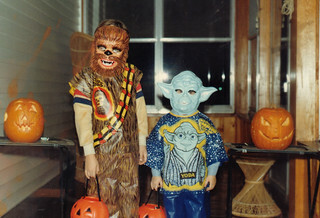 I was dressed as Chewbacca, and my brother Dave as Yoda. We generally went for cheap plastic costumes back in those days, but note that I had deliberately chosen a brown shirt to wear under it. That was my way of 'completing' the costume--that brown was meant to be Chewie's hairy arms. Also note that these awful costumes had the faces of the characters on them. At least the Chewie costume had fur and a bandolier. The Yoda costume didn't make any pretense of having the kid wearing it look like Yoda, beyond the mask. And since when does Yoda have blue skin? Anyway, trick-or-treating back then basically consisted of piling into Mom's car to go knock on the doors of a few select people from church... many of whom were little old ladies. I remember that they had never seen Star Wars or Empire, and had no idea what we were supposed to be dressed as. To them, we were just 'monsters' on Halloween. I remember being astonished that anyone could not know who Star Wars characters were... Star Wars was pretty much my whole world back then.